We have all wondered at some point what mysteries our Solar System holds. After all, the eight planets (plus Pluto and all those other dwarf planets) orbit within a very small volume of the heliosphere; the volume of space dominated by the influence of the Sun. So, what’s going on in the rest of the volume we call home? As we send more robots into space, improve our observational capabilities and begin to experience space for ourselves, we learn more and more about the high strangeness of our own Solar System. There are 194 moons we currently know about; a bizarre giant hexagon on Saturn; seven water worlds with liquid subsurface oceans; an atmosphere on Pluto; liquid water below the surface of Mars and even frozen water ice on Mercury and our own Moon. There are millions of asteroids in the Asteroid Belt; trillions of comets and other icy objects in the Kuiper Belt and a weird hollow sphere of icy, primordial material over 2 light-years in diameter called the Oort Cloud in which our entire Solar System rides through interstellar space. We don’t understand even half of what’s going on around us, there is so much more to be discovered. Who knows what we will find next. 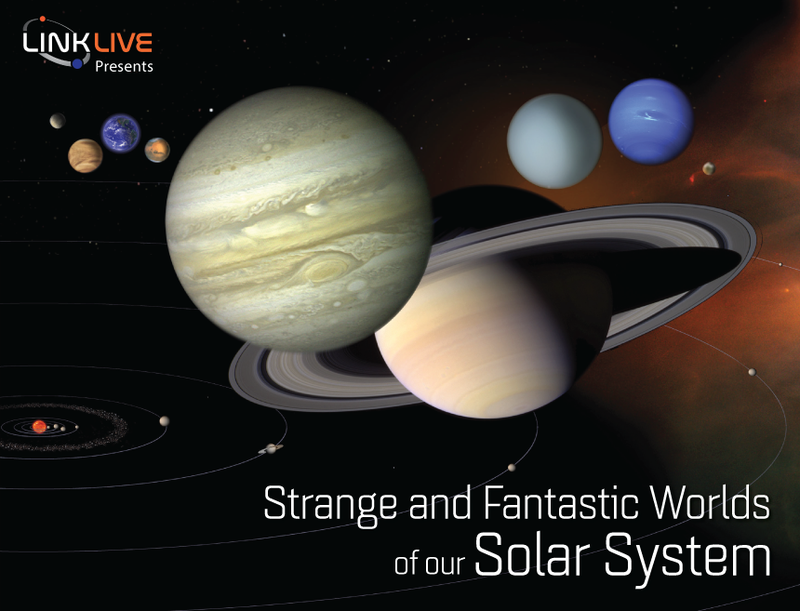 Join us as we uncover the bizarre oddities on the strange and fantastic worlds of our Solar System. Link is a global community, welcoming people from every discipline and culture who seek a deeper understanding of our place in the universe. We believe passionately in the power of inspiration and understanding of STEM disciplines (science, technology, engineering and mathematics) to change attitudes, lives and ultimately, the world. Since its beginning in 2012, hundreds of award winning LinkLive public events have been enjoyed by sell-out crowds throughout the Midwest. LinkLive is an audio/visual spectacle utilizing a variety of guest speakers, and the very latest in theater screen digital imagery, animations, music and multimedia technology. LinkLive events create an engaging and thought-provoking environment as we share the wonders of the universe in ways that inspire, excite, challenge and educate.